Recently I was challenged to run old arcade video games on modern low cost ARM development boards. So here is a tutorial which will guide you how to play your favorite games for the '80s such as Moon Patrol with open source software on open source (and not only) hardware ARM device. MAME stands for Multiple Arcade Machine Emulator and it is an open source project for porting popular arcade games from the late '70s, '80s and '90s. It is available for Windows, Mac OS X and Linux. It was very easy to get MAME working on my laptop with Intel i5 CPU and Ubuntu but it was more complicated with ARM development boards. The advantages of the ARM development boards are the low cost and low power consumption. The OLinuXino boards, manufactured by Olimex, are open source hardware so they are they are my preferred choice for rapid prototyping. In general one of the main issues with any ARM development boards is the support of proper drivers for hardware graphic acceleration on Linux. MAME exists as a Debian package for ARM devices but unfortunately I got a segmentation fault when I tried to run it. After that I build version 0.157 from source but I got the same error when I tried to launch it. 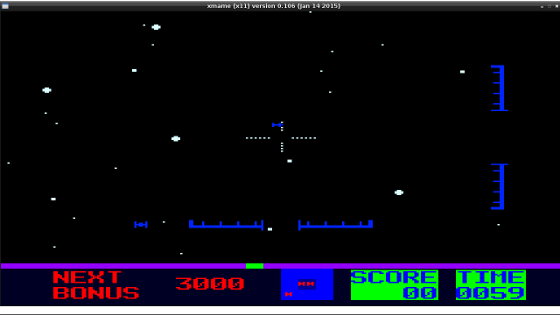 MAME relies on SDL2 library to provide low level access to graphics hardware via OpenGL. All ARM devices on which I tried to run MAME have Mali GPU and my guess is that its drivers were not properly functioning with SDL2. I switched to plan B: XMAME. This is a port of MAME for X11/Unix systems which was merged into to the mainstream project several years ago. I built XMAME 0.106 from scratch. 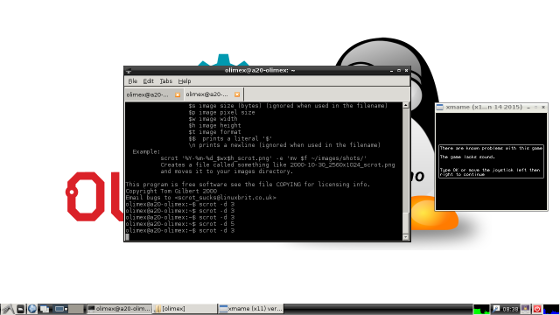 Although it is possible to cross compile XMAME for ARM on a personal computer with Intel or AMD CPU, I preferred to build it directly on the ARM device. Finally I was able to play arcade games on my ARM development boards! The procedure for building XMAME for ARM described below has been tested devices with ARMv7 compatible CPU. For owners of Raspberry Pi, which has ARMv6 CPU, it will be easier to use the OS image for gaming called PiPlay. You will need a ROM to play a game. ROMs for MAME are distributed as ZIP archives. Several ROMs are officially distributed for free at the website of the MAME project. You can also find a lot of other ROMs for MAME in the web. Download a ROM, for example Star Fire and save it at directory roms.